Gescrap (so far it is, still under contractual discussion) Bizkaia had to open the box of the tricks if he wanted to defeat a 3-0 Asefa Estudiantes. First spades at the local side were Hamilton (21pt), Mumbrú and Vasileiadis, who faced a fierce opposition from Gabriel, Kirksay and English. But thee is one tru thing. When you want to win a playoff game, you have to play a bunch of them first. And Bizkaia is much more used to it. CLUBESTUDIANTES.COM.- Asefa Estudiantes made Tariq Kirksay to start opening the defensive can from the locals. He had lost some sessions along the week due to physical problems. He went into long distance throwing and he was doint it again. Gescrap Bizkaia reacted with one gear further and guard Kostas Vasileiadis signed a reaction for 16-10. Our fans (a 200 Asefa Estu commando tripped to Bilbao) are not ready for these emotions yet. Jayson Granger drove the tempo with sharp layups and Lucas "Sideshow Bob" Nogueira blocked shot connected with English for the tie. Once again the options in scoring were good. Is it so different from previous season... and Estudiantes scored again (fourth game on a row) 22 points or more at the end of first quarter. From the distance, followers of Estu radio and internet-live at ACB website were having the feeling that things are being made good. But the locals are ACB Finals runners up and they are coached by a Greek expert. Is this another league we are playing at? Second period started with the inside power of PF German Gabriel. Bizkaia reacted with a variety of players; Pilepic, Raül, Grimau, all them veterans from a thousand battles. The weight of Estudiantes scoring was given to centers and PFs. Vidorreta introduced more options than well studied English shooting. Gabriel was freed to try scoring inside, outside and he did pretty well. The feeling from of other season's defeat spirit had changed and visitors differences remained solid at +6 to +10 at the half-time. Being a young team with a mere 8 to 9 rooster is a titan's task. Kirksay and Gabriel were sustaining the scoring but it was a question of density. Bizkaia gave Mumbrú an invitation for the party. To every local effort ahead, Estudiantes proved Vidorreta's spirit and work towards a sort of road-roller basketball. Recovered guard Jayson Granger, who ended last game against Cajasol with stitched head and an Adams Family look, established a +9 for a 51-60. You heard of the Miribilla effect, right? Asefa Estudiantes dumped the averaged for some minutes. It was not a comfortable game. You know it but you quite can't remember when it was the last time you suffered. Estudiantes just used to let the games rotten at 2011 season. Fans start to discover themselves again talking about referees and critical decisions. A flagrant foul to Granger made Bizkaia to close the gap down to almost zero. 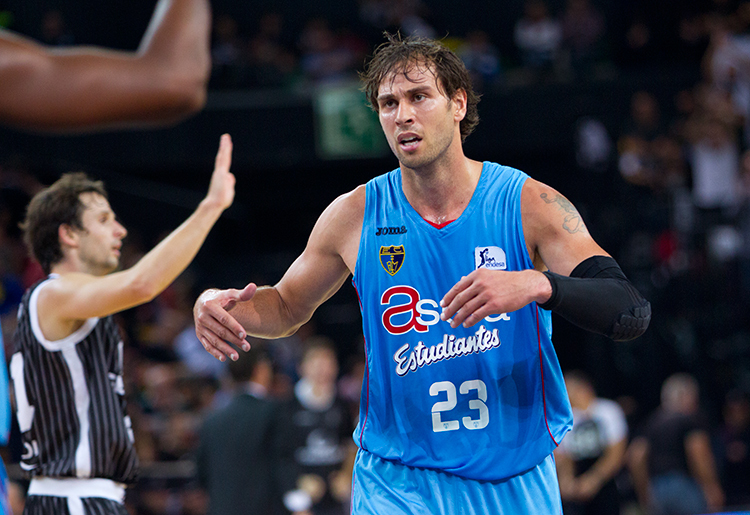 High voltage basketball made ex NBA guard Raül López to take his best. Estudiantes fans have from time to time to be piched. Yes we were competing neck to neck with a playoff and Finals team. After all we had survived to three quarters of the game (62-61). Lamont Barnes and Carl English justified why this Asefa Estu deserves more credit than a mere fight to avoid relegation. With six minutes to go, Raúl and Vasileiadis forced it all. Captain Canada scored a three-pointer to re-establish maximum tension and 64-66. Bilbao Basket had to employ all patience and skills from guys such Hamilton, Hervelle, furious warriors that forced Barnes and Gabriel to give 120%. Barnes foul made Txus Vidorreta to get out of his nerves and the visitor coach was given a technical foul. It was PO tension and one team of the two was to pay the taxes. Four free throws gave GBB a six point lead. It was reduced to three by Jayson Granger and Kirksay. A nail-biting fourth period was to be solved by the infamous FT lottery. Maccabi? Caserta? Barcelona? No, mate. A fighting co-leader called Asefa Estudiantes had all the stakes over the table. Lamont Hamilton, the center from Saint John's, had promised hard work when he was signed from French Paris Levallois. He worked and worked the hell out of it and rebounded for a ninety seconds final with 80-78. Two free throws from Germán Gabriel equalled the whole thing until Hamilton again and a buzzer beater from Vasileiadis broke the game for Bilbao. Alex English and Kule Kuric tried the impossible but we'd better face it. It was impossible yet. It was so close... but lads and peeps, it was the moment Estudiantes had to touch the ground and, still, enjoy his play-off position at the League standings. GESCRAP BIZKAIA 86 (20-21-21-24) Zisis 2, Rakovic 9, Pilepic 9,Hamilton 21, Mumbrú 10, Hervelle 8, Moerman 0, López 7, Vasileiadis 15, Grimau 5. Did'nt play : Sánchez y Samb.